Tamara Mendels’ new series of paintings, White Out, is a striking and cohesive body of work. Mendels’ visual language is one she has developed through a rigorous and sustained painting practice. Her technique for making these works is both complex and disciplined. Layers of expressive underpainting are captured in a gesture made in clear resin. A final layer of white enamel paint then erases the remainder of the background, leaving us with only a hint of what lies below the surface. Two simple lines, one black and one red, stand out among the more complex, brightly coloured forms of many of the works. The simplicity of these two works communicates the importance of the artist’s final gesture. After building the underpainting over a period of time, this gesture takes place in one fluid and quickly executed moment. As we begin to visually understand this process, we see that many of these lines and forms reassert themselves throughout the series. The effect is rhythmic. The repetition of formal elements draws us into a narrative between the works. The narrative is ambiguous, but filled with intrigue—driven by colour, form and line, figure and ground. In most of the works, the gesture is contained within the frame of the canvas, mapping movement, contemplating time. In a few of the works however, this framing is interrupted; the space and time of the works becomes unbounded. We can see and feel the influence of her forebears in these works: the expressive lines of Franz Kline and Brice Marden; the repetition of forms as in the work of Robert Motherwell; and in her discussion of the recurring innate mask or badge-like form, Mendels expresses her affinity with, and respect for, such key influences as Georg Baselitz and Jonathan Lasker. 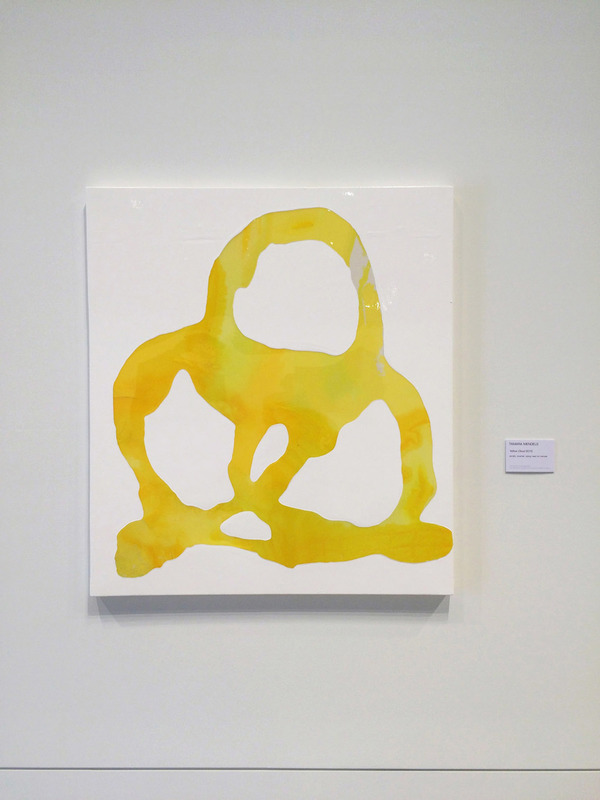 Having lived and worked in the United States of America from 2008 to 2010, Mendels feels a strong connection to her American counterparts—in particular Markus Linnenbrink, Dan Colen and Joe Bradley—and their work using painting as a conceptual tool to investigate personal, political and material concerns. In Mendels’ paintings, the layered gestures, the imperfections of a drip down the edge of the canvas, a bubble or an insect caught in the resin are held in tension with the polished and resolved finish. For Mendels, this tension speaks to the current conditions of painting: the balance between the hand and the machine-made, the authentic and the commercial. Her work acknowledges and explores the contradictions and ambiguities of the medium in which she works. In discussing her practice, it is evident that Mendels’ returned to Australia in 2011 with a broader understanding of her own project. Mendels’ global outlook is significant as an emerging artist, however her work operates through a lineage of Australian painting. 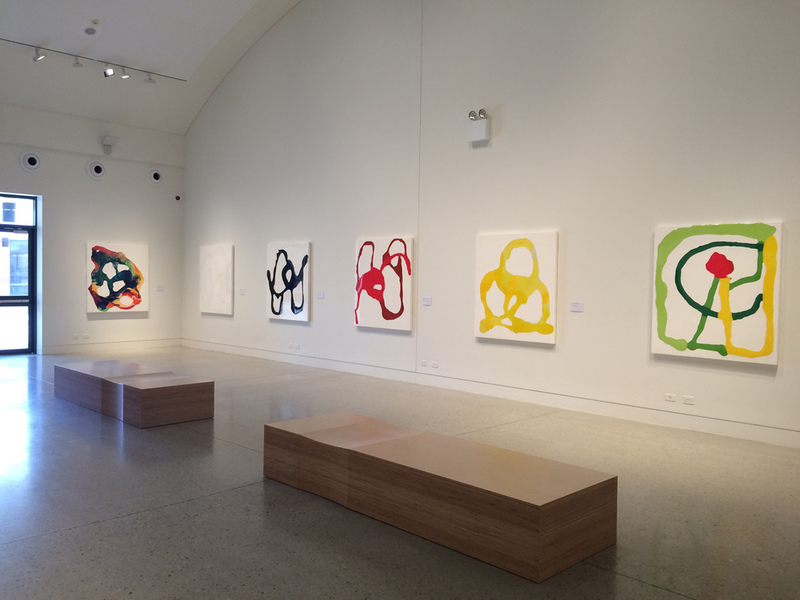 Her intuitive gestures recall that of Tony Tuckson and Ian Fairweather, and more recently the body language of Emily Kngwarreye and Ildiko Kovacs. For these artists, mark making is transformative; the line is an expression of, or perception of, their experience in the world. Mendels’ approach to this is a performative one; the process of creating her paintings takes place over several stages, making use of different approaches to pouring and applying paint, while working over a canvas that sits horizontally on crates. The canvas becomes an extension of the artist. This process not only aligns her with the American action painters, but also with the immersive approach of remote Aboriginal painters. It is interesting to consider Mendels’ work in this local context: encompassing the shifting relationships of influence between Indigenous and non-Indigenous painting. Indeed Brisbane-based art historian Rex Butler has written of the way in which Aboriginal Art has shed light on our understanding of Abstract Expressionism, allowing us to better comprehend the truly abstract communication of ‘meaningful without meaning,’[i] a sensation that is created in the narrative between Mendels’ works. Further, in her final application of white enamel paint—erasing much of the intricate underpainting—Mendels’ process exists somewhere between the grey over-painting of iconic Fred Williams landscapes and ‘Buwayak’[ii]—the concealing white markings of contemporary Yolngu art from North East Arnhem Land. Over the last twelve years, Mendels has methodically developed this signature process and style through a thorough investigation of the actions of painting. Drawing from the history of Western abstraction—in particular the ‘encounter’ of the action painters and the emotional and spiritual intentions of lyrical abstraction—Mendels’ work functions in the conceptual project of expanded painting. [iii] Her work articulates European critic and theorist Jan Verwoert’s philosophy of action. Verwoert questions: ‘What does it mean to act in painting, through painting? What kinds of forms of action do paintings suggest?’[iv] As Verwoert suggests, painting today takes into account the history of what has been done in this medium up to the current moment. After conceptual art, painting is a strategic and conceptual action. So too, Mendels’ paintings record the actions layered (or performed) upon the canvas. Working within this process-driven framework, Mendels’ work clearly articulates the impact of her environment. The delicacy of the resin and enamel paint means the process is affected by weather, light and dust, often recording these impacts in the surface of the paintings. Her practice is now firmly rooted in her studio and home in the Blue Mountains, where she has lived since returning to Australia. Among many impacts, the low lighting of this studio has seen the introduction of the radiant colours of this series. Mendels’ process has also recently adapted to family life, with the introduction of the finger paint app on her iPhone. Using this technology, Mendels began making preliminary drawings for her paintings, rather than working directly on the canvas. Her works have retained her style and aesthetic—working with figure, ground and line—however with the introduction of these drawings Mendels can map out her paintings in a way previously unavailable due to the immediacy of her materials. This development has solidified her process-driven practice as a conceptual gesture that can be manipulated to investigate new ideas. In this series, Mendels has also begun a number of black paintings, working with black resin as the final layer rather than the white enamel. These works achieve a more subtle figure/ground relationship, drawing us further into the surface of the paintings. As part of the overall narrative, both the variations and repetitions in the series White Out, act to reveal more of the artists’ actions and environment, piece by piece. The effect is a circular narrative of perpetual discovery filled with desire and intrigue; much like the gestures of the paintings themselves. [i] Rex Butler, "What was Abstract Expressionism? : Abstract Expressionism through Aboriginal Art," in Abstract Expressionism Symposium: Action. Painting. Now. (National Gallery of Australia, 2012). [ii] ‘Buwayak’ is the Yolngu-matha word for ‘invisibility’ and refers specifically to a method of abstracting and concealing sacred clan designs through a strategic use of white over-painting. See the catalogue for: “Buwayak: Invisibility,” Annandale Galleries (in association with Buku-Larrnggay Mulka) 9 April – 17 May 2003. [iii] ‘Expanded painting’ is a way of thinking about painting which references American theorist and critic Rosalind Krauss’ essay Sculpture in the Expanded Field, 1979. Sydney-based artist and writer Mark Titmarsh has written that expanded painting functions as a field of possibilities that questions what painting is and what it can become. See: Rosalind Krauss, “Sculpture in the Expanded Field,” October 8 (Spring 1979) and Mark Titmarsh, “Shapes of inhabitation: Painting in the expanded Field,” Art Monthly Australia 189 (May 2006). [iv] Jan Verwoert, “Opening-Day Talk: Painting in the Present Tense,” in Painter Painter, Walker Art Centre (YouTube, 2013).